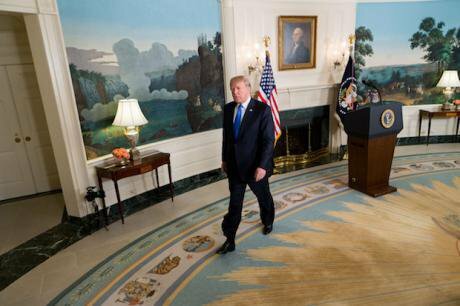 Donald Trump leaves the podium after announcing new Iran strategy at the White House in Washington D.C., the United States, on Oct. 13, 2017. Picture by Ting Shen/Xinhua News Agency/PA Images. All rights reserved. Donald Trump is unpredictable and erratic, yet the ulterior motive for a lot of his decisions seems fairly unsophisticated: as Ta Nahisi Coates points out in his brilliant piece, Trump’s ultimate motive is to obliterate the legacy of Barack Obama. The more Obama prided himself on an achievement, the more adamant Trump becomes on destroying it. The Iran deal was a policy Obama advocated passionately. No wonder Trump stubbornly pursues its destruction. Trump has given a few speeches about the Iran deal. He is yet to come up with any substantial argument against it. He throws in talking points and threadbare clichés about Iran, without saying anything new. Most likely without realizing it, Trump is in fact yet another figure in the long line of imperial leaders who have tapped into a certain image of Iran, without caring whether it bears any resemblance to its reality. The current US ambassador to the UN, Nikki Haley, is a staunch anti-Iran operator. She apparently played a significant role in shaping Trump’s position on Iran. Haley appears to be working on the deal, but she actually talks a lot about Iran without really mentioning the deal. Her sole relevant point is that Iran ‘might be cheating on the deal’, that Iranians have hidden nuclear sites and are violating the deal in secret, that Tehran has two faces, one shown to the world, one kept to itself. The idea of hiding ‘real’ face also emerged in Trump’s belligerent UN speech: ‘The Iranian government masks a corrupt dictatorship behind the false guise of a democracy.’ Iran hides its reality, and unless we rend the mask asunder, Iranians will not show their real faces to the world. For Trump and Haley, the problem with Iran is not what Tehran actually does. It is framed as a moral one. They are mad that Iranians act stealthily and deviously. This stereotype-making machine functions so effectively that Iranians themselves voluntarily consume its products. Other republicans precede Trump in articulating this view. In March 2015, after Iran and six world powers struck the deal, the word ‘cheating’ and its derivatives appeared with fascinating frequency in anti-deal argument. Senator Bob Corker believed that, given Iran is sneaky and untrustworthy, the deal could never be sufficiently verifiable. Experts and pundits came on board fast, writing alarming pieces about cheating: ‘Iran could cheat by shipping secretly built nuclear arms to North Korea’. Even before the final deal was reached, an article in Foreign Policy came with this title: ‘Is Iran Already Cheating on a Nuclear Deal?’, based on the hardly relevant fact that an institution for nuclear research had opened in Tehran. With surprising consistency, the people determined to undermine the deal portray Iran and Iranians as cunning and duplicitous, as a people with two faces: one public and one private, one for themselves and one designed to deceive the world. This stereotype-making machine functions so effectively that Iranians themselves voluntarily consume its products. On a Yahoo Answers page, a user asked the following question: ‘What are the stereotypes of Iranians/Persians?’ the ‘best answer’, voted to the top of the list by other users, was Presumably written by an Iranian: ‘Unfortunately we tend to deceive other people and trick them, normally with making friendly faces and act [sic] like an old friend, until the last moment of final blow’. That answer can also be heard in taxi chats and family gatherings in Tehran. The roots of such image, like many other misunderstandings about the Middle East, should be sought out in the nineteenth century, when the European colonial powers were at the height of their game. The first wave of books about Persia, including travelogues and diplomatic accounts and novels, appeared in early 19th century. They constitute a seemingly disparate set of documents produced by quite different people. Yet, a closer look reveals that they largely consolidated various aspects of one image. A substantial portion of those texts attempt to capture the essence of ‘Persian character’. Despite the different experiences of their authors, they reached surprisingly similar conclusions. Professional diplomats such as sir John Malcolm and Lord Curzon tended to maintain a veneer of nuance in their accounts. Going to more crude, direct documents by non-diplomats give us a sharper picture. Among those, a memoir by John McDonald Kinnier stands out. He describes Persians as ‘gentle and insinuating in their address’, yet ‘profoundly versed in all the arts of deceit and hypocrisy.’ Two centuries ago, Kinnier resorted to the same cliché that today Trump is presenting as his core argument: the appearance is only a mask to conceal the viciousness behind. Trump might lead America into another war on the basis of a colonial fabrication. Edward Scott Waring, who worked in East India company at the time, couldn’t agree more in his book: ‘Persians are pleasing and entertaining companions, but not the least reliance is to be placed on their words […] it is necessary to distrust all their declarations.’ It is as if the words are plucked out of John Bolton or Nikki Haley’s mouth. No Englishman of the time accrued more credit for shaping a certain image of Persians than James Morier. This British diplomat, who subscribed to the same image by calling Persians ‘talkative, complementary, and insincere people, yet in manner agreeable and enlivening,’ penned the novel ‘The Adventures of Hajji Baba of Isfahan’, a meandering, humorous tale of a full-blown Persian imposter that indulges in deception and swindling. The novel was applauded by many. Sir Walter Scott regarded it as the first realistic, accurate portrait of Persian characters in fiction. Even to this day, it is not unlikely to come across occasional citations of Hajji Baba as an example of authentic fictional character. I still find it a mystery that the image of Persians as hypocritical and unreliable is so deeply entrenched in the western imagination, and affects policymaking on such high levels. Among potential explanations, I believe the myth of ‘Aryan’ race is more convincing than others. In his exhaustive study of Persian and Persians, Lord Curzon encourages close relationship with Persia, because according to him, the white ancestors of Persians moved to Europe and birthed the white race. Curzon implies that since Persians were not Semitic, they were not exactly the ‘other’ of the west. They were the poor, shunned cousin, corrupted by intermingling with other races. Therefore, Persians have always had the volatile status of being intimate and distant at the same time. Unlike the brazen imperial swaggering the British demonstrated in the Arab world, they were never quite sure how to deal with Persia. The history of colonialism is as solidly connected with the current decision making in foreign policy as the history of slavery with police brutality against people of color in America. The nebulousness of being racially in and culturally out was translated into a construction of Persians as duplicitous and sneaky. It gave rise to an illusory image the western powers still tend to accept. The discourse of Trump and his acolytes is the most recent manifestation of that ideological construction. It could be the most dangerous one. Trump might lead America into another war on the basis of a colonial fabrication. The history of colonialism is as solidly connected with the current decision making in foreign policy as the history of slavery with police brutality against people of color in America. The latter is discussed widely, yet the media is eerily mute about the former. The same kind of muteness contributed to the passivity of the American media during the lead-up to the Iraq war. It might fan the flames of another catastrophe.